If you’ve been following my coverage of this year’s Seafood Expo North America (SENA15), you know I found it noteworthy how many times I heard speakers presenting in the “Seafood Sustainability” conference track speaking about the word “sustainable” in a less than enthusiastic manner. For example, I heard people well-respected for their leadership on seafood sustainability issues say things like: “I don’t really like the ‘s’ word,” “Sustainability is trying to do too much in one word,” “Sustainability is a tough word,” and “Sustainability is the most hackneyed word in our vocabulary.” To be clear, it’s generally not the concept of sustainability from which I heard these thought leaders distancing themselves so much as it’s the current usage and the way that current usage plays out on a place like the SENA15 exhibit hall floor. It wasn’t too long ago that a “Seafood Sustainability” conference track at a major seafood industry event like SENA15 would have been focused on addressing the lack of sustainability claims in the industry. Today, that conversation has changed. 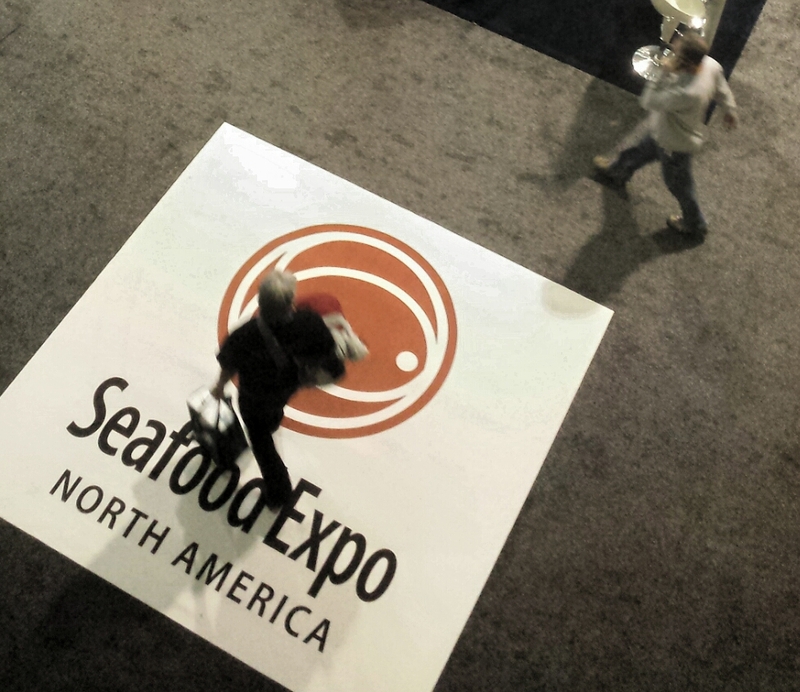 Walk the exhibitor floor at SENA15 or any other major seafood industry event in 2015, and you’re going to see and hear a plethora of sustainability claims. It’s perhaps worth remembering that this proliferation of sustainability talk is a relatively recent phenomenon not just in the seafood industry, but everywhere. It is generally agreed that the word sustainable did not possess its current meaning (i.e., “capable of being continued at a certain level”) in common usage until the mid 1960s. The Google Books Ngram Viewer tool, which searches words and phrases found in Google books, gives us a nice visual representation of how sustainability has gained popularity from the 1970s to today. By the middle of the first decade of this century–just about a decade ago–“sustainable” had achieved buzzword status, crossing over to popular media. According to the Bookworm: Movies tool, which searches nearly 90,000 movies and TV shows, even movie-goers may have observed the trend with the usage of the word “sustainable” peaking in onscreen language in 2008 . Bookworm: Movies online tool shows that the word “sustainable” peaked in onscreen usage around 2008. It’s not surprising (at all) that the trend can also be seen in the media. 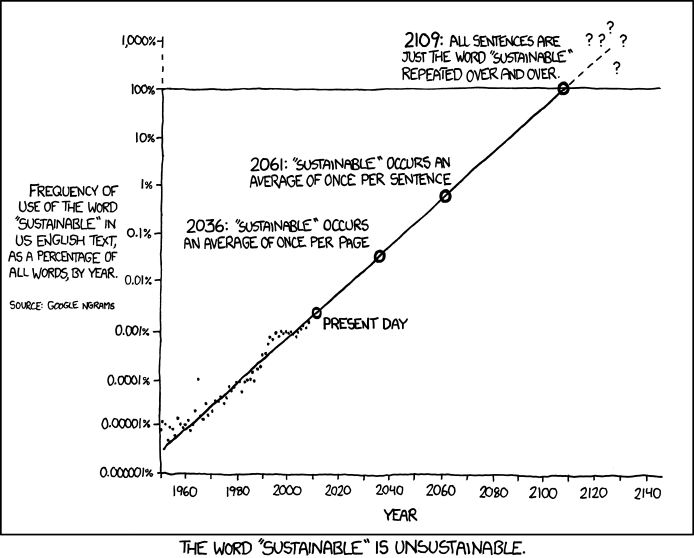 In 2005, for example, the word “sustainable” appeared in 321 New York Times articles according to the Times’ word usage frequency tool Chronicle. By 2009, however, “sustainable” was found in 1247 articles, and in 2011, the word sustainable appeared in a record-breaking 1254 articles. Some worried the word was at the heart of a plethora of greenwashing campaigns, where companies were using “sustainable” primarily from a marketing perspective to appeal to customers without actually defining what it meant. For those who did define what it meant, there were sometimes questions about verifying those claims. Specific to the seafood industry, major players like Wal-Mart began to engage relatively early by tying their claims to third-party certification. In 2006, for example, Wal-Mart announced its goal was to carry 100 percent MSC-certified wild-caught fishes in its stores within five years. By the time 2011 rolled around, however, people were already beginning to question sustainability claims, wondering, as Munroe did, if the word had lost its meaning. Ironically, this miasma of doubt surrounding sustainability was descending just as the seafood industry as a whole was finally coming up to speed with a largely uncoordinated but thoroughly pervasive sustainability campaign. Sustainable seafood was becoming a hot topic in supermarkets and the news media. In 2005, only two articles in the NYT used the phrase “sustainable seafood,” but by 2011, the number of articles containing the phrase had jumped to 39. A 2013 survey of 3,000 Americans, conducted on behalf of NPR by Truven Health Analytics, found that most Americans said “sustainably caught” seafood was important to them. Part of what is driving seafood companies to use the term sustainable is the fact that “sustainable” is a word that appeared to have some cache with the consumer. The data are all over the place, but when it comes to showing consumer demand for sustainable seafood, a widely publicized 2013 study found that a majority of Americans said that “sustainably caught” seafood was important to them (more than half also said they would not pay more for it). The world’s largest and most recognized sustainable seafood certification is issued by the Marine Stewardship Council (MSC), and the number of fisheries certified by MSC has, not surprisingly, risen dramatically during the time period we’ve been discussing. 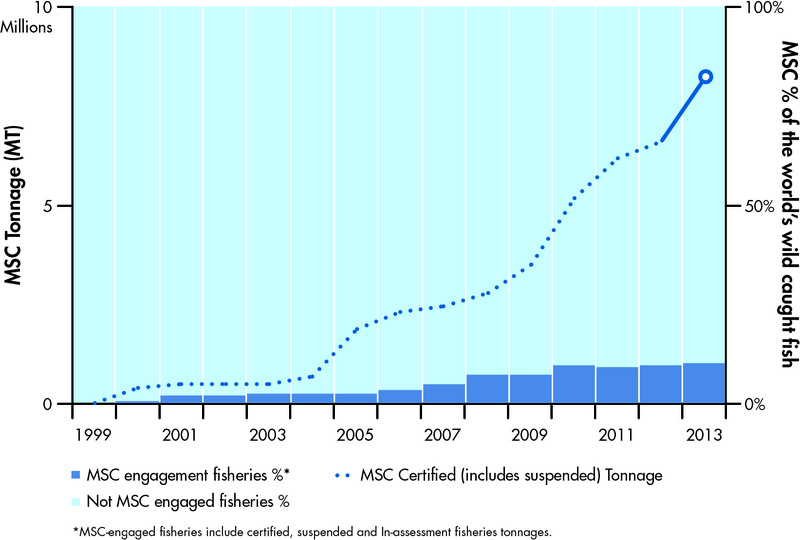 As of 2013, the number of MSC certified fisheries had increased by over 420% in just five years according to Biodiversity Indicators Partnership. At that time, it was estimated that MSC certified fisheries represented just under 10% of wild-harvest worldwide. All fishing methods have an impact on the marine environment but fisheries that have been certified to the MSC standard for sustainable fishing must demonstrate that their impact is minimal and they are well managed. For example, bottom trawling is often cited as an example of a damaging fishing method, but bottom-trawl fisheries are not excluded from the MSC program. Instead, the MSC certification program is open to all fisheries that are sustainable, well managed and have effective controls and enforcement. For a bottom trawl fishery feeling pressure from NGOs and others concerned about the ecological effects of bottom trawling, an MSC certification can shift the discussion from a conversation where the fishery is defending bottom trawling to a much easier conversation affirming that the fishery is certified sustainable. Because many of the most trusted consumer-facing tools like Monterey Bay Aquarium’s Seafood Watch Guide, automatically align with MSC certified fisheries, a worthwhile dialog about becoming more sustainable can be effectively silenced by a fishery using the word “sustainable” like a binary on-off switch. When major Seafood industry players like High Liner Foods or Wal-Mart claim greater than 90% sustainability, we begin to really see how the word sustainability is becoming unsustainable. This is not to say that these companies have not made commendable progress along their respective journeys toward sustainability, but to claim that they have all but achieved their goals is problematic on several fronts. First, both of the aforementioned companies are basing their claims largely on internal goals of sourcing the vast majority (if not 100%) of their wild-harvested seafood from MSC certified fisheries. That is no doubt an admirable goal, but given that only 20% of wild fisheries worldwide even have a realistic shot at being certified (because they are the only ones that possess the requisite money, organization and data), we must understand that such claims marginalize the vast majority of fisheries. Millions of people depend on these marginalized fisheries, and they have very real incentive (e.g., feeding their families) to sell their product somewhere. The other problem with claiming 90, 95 or 100 percent sustainability is that it treats sustainability as an endpoint, which it can’t be if we’re going to see continued progress. Sustainability is not a race with a well-defined finish line. The risk of treating sustainability as an endpoint–a finish line–is that once the line is crossed, what incentive is there to keep going? Do we really want seafood industry entities to reach the sustainability finish line and then rest on their laurels as the majority of global fisheries continue to struggle? The journey toward sustainability must be seen as a journey and a process if we are to move the dial globally rather than just within the boardroom. 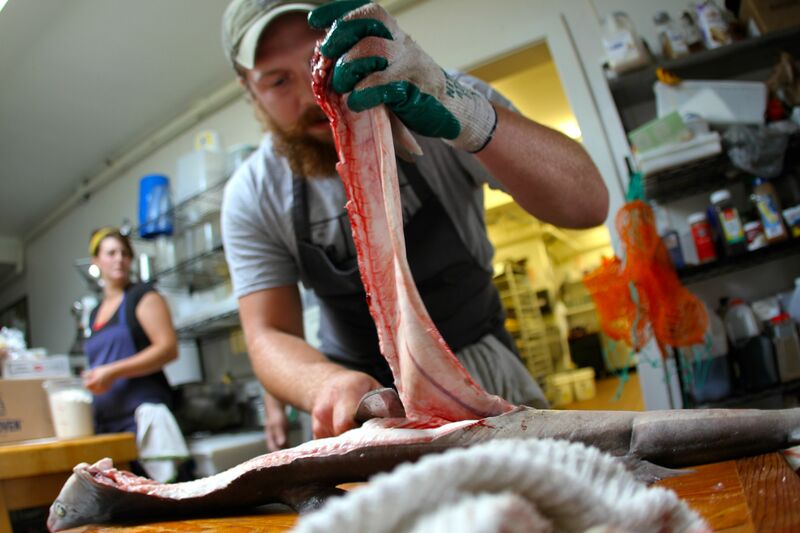 Chef Max Miller of the Landings Restaurant in Rockland, Maine, filleting locally-sourced fish. The other business is a big box retailer that deals in such large volume that is has little choice but to rely on third-party certification schemes to meet its own internal sustainability goals. A very high percentage of the seafood sold by this retailer is indeed “certified sustainable” by a third-party certification scheme. Much of it, however, is sourced from fisheries half a world away, requiring a much larger carbon footprint to bring those products to market. Still, the seafood is “certified sustainable,” and this model also fits with many people’s definition of sustainable. To me, the biggest difference between these two businesses is that the restaurant is engaged in a journey toward sustainability, while the retailer is looking at sustainability as an endpoint (e.g., “We are 100% sustainable.”). Both businesses have a legitimate claim to sustainability, and both are making progress along their respective paths to sustainability, but using the same word to describe both fails to acknowledge the colossal difference between the two. And that’s really the trouble with tacking the word “sustainable” on a piece of seafood or on a business–without a lot of context, we simply don’t know what it means. The bottom line here for me is that we’ve come a long way. Fifty years ago we weren’t even using the word “sustainable,” and now its nearly ubiquitous. As the context surrounding the seafood sustainability discussion changes, we must challenge ourselves to change our goals and aspirations with it. We must also challenge each other and continually reset the bar. We’ve come a long way, but there are still many challenges and many opportunities on the horizon. This is one reason I so enjoy attending the Seafood Expo North America and other events where industry, NGOs and academics can interact. As long as we’re having the discussion, the future looks bright. This entry was posted in Ecolabels, Marine Stewardship Council and tagged certification, definition of sustainable, Marine Stewardship Council, Seafood Expo North America, SENA15, sustainability, sustainability trends, sustainable seafood, third party certification. Bookmark the permalink.